Brian Riedl, a senior fellow at the Manhattan Institute, recently released a budget plan to stabilize debt over the long term. The plan proposes significant and specific changes to reduce Social Security and health care spending, while charting a more sustainable path for discretionary and other mandatory spending and filling the remaining gap with revenue increases. At a time when too many are suggesting policies that would make the debt worse, this plan is a welcome contribution to suggest how we could make it better. By his own measures, Riedl's plan would substantially slow the growth of spending while also increasing net tax revenue. Under his plan, spending will rise from 20.6 percent of GDP today to 22.4 percent by 2030 and 23.3 by 2048. That's a 6 percent of GDP reduction relative to current law and an 8.2 percent of GDP reduction relative to Riedl's current policy baseline. Revenue, meanwhile, will rise from 16.6 percent of GDP in 2018 to 18.3 percent by 2030 and 20.1 percent by 2048. Relative to Riedl's current policy baseline, this is a significant tax hike of 1.5 percent of GDP in 2048. However, it represents only a small 0.3 percent of GDP increase relative to current law. In fact, it appears total revenue over the next three decades would be roughly in line with current law since the gains from Riedl's new revenue proposals would essentially all go to finance the cost of extending the large tax cuts enacted under the Tax Cuts and Jobs Act. Sources: Riedl, Congressional Budget Office. Taken together, these changes would reduce deficits from 4 percent of GDP today to 3 percent of GDP by 2048, compared to 10 percent under current law and 13 percent under current policy. The result would be a significantly improved debt outlook. 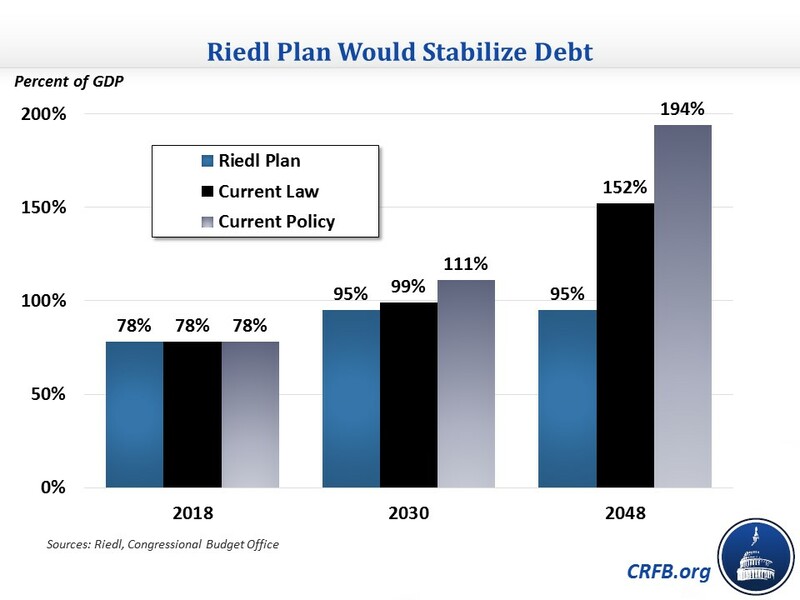 Riedl's plan would allow debt to continue to rise over the next decade but would ultimately stabilize debt at 95 percent of GDP through at least 2048. These debt levels are still far too high: they are dangerously close to the all-time records sets during World War II and would leave little fiscal space in case of another crisis and recession. But they are a substantial improvement in comparison to our current trajectory, which has debt rising to 152 percent under current law and 194 percent under Riedl's current policy baseline. Importantly, Riedl's plan achieves deficit reduction largely through specific policy choices. On the spending side, most savings come from the three largest programs – Social Security, Medicare, and Medicaid. For Social Security, he relies on Ways and Means Social Security Subcommittee Chairman Sam Johnson's (R-TX) reform plan as a starting point. That legislation would get the bulk of its savings from raising the retirement age from 67 to 69, using the chained CPI for cost-of-living adjustments (COLAs) while denying COLAs to high-income beneficiaries, and reducing initial benefit growth for the top half of earners. It would offset some of these savings with targeted benefit increases to low-income and older beneficiaries. Overall, these changes would significantly reduce Social Security's growth as a share of GDP from 4.9 percent in 2018 to 5.1 percent in 2048, compared to 6.3 percent under current law. For Medicare, Riedl would most notably switch to a premium support system, where enrollees would receive a subsidy equal to the average bid of competing private plans. In addition, he would increase Part B and D premiums from 25 percent of per-person costs to 50 and 40 percent, respectively, while phasing out the portion that Medicare pays between the 40th and 80th percentile of earnings (meaning that people earning above the 80th percentile would be responsible for the entire cost of these parts). These changes would significantly reduce Medicare spending growth, resulting in Medicare growing from 2.9 percent of GDP in 2018 to 4.4 percent in 2048, compared to 5.9 percent under current law. For Medicaid, Riedl would gradually reduce the higher matching rate for the Medicaid expansion to the rate for other Medicaid enrollees, then cap the growth of federal spending after 2023 at 3.5 percent for children and adults and 4 percent for the elderly and disabled. These changes would result in Medicaid spending growing from 1.9 percent of GDP in 2018 to 2.2 percent in 2048, below the 2.8 percent under current law. The plan is less specific on discretionary and other mandatory spending, proposing paths for spending rather than specific policies. For discretionary spending, Riedl would allow spending to be higher than current law in the short term (though below current policy where recent spending increases are continued), then eventually allow spending to dip slightly below current law. For other mandatory spending, he would reduce the long-term growth rate below current law. When it comes to revenue, Riedl's plan includes two significant tax increases. First, he would cap the exclusion for employer-provided health insurance at the 75th percentile of premiums and grow the threshold with inflation. This change would likely generate increasing tax revenue over time while also slowing health care cost growth. Second, Riedl would increase Social Security and Medicare payroll taxes by 1 percentage point each while adding an equivalent income tax surcharge above the Social Security taxable maximum ($128,400 in 2018). Effectively, this is the equivalent to a 2 percent increase in the payroll tax on all wages. Riedl would also raise a small amount of revenue from allowing certain tax extenders that expired at the end of last year to remain expired. As mentioned before, these revenue changes would raise revenue compared to Riedl's baseline, but under a more accurate current law baseline they simply pay for the extension of existing tax cuts. While a current policy baseline is helpful to show where the political system may be headed, assuming it as a starting point adds greatly to the full cost of the tax cuts and allows the gimmick of fake expirations to triumph again. We believe any plan should use a current law baseline and offer specific proposals to offset the costs of extending any of the tax cuts (the same applies for the Bipartisan Budget Act). But bottom line: Riedl deserves tremendous credit for putting out a bold, specific, and thoughtful plan to dramatically improve the nation's fiscal situation. Riedl provides a valuable service by showing the type and magnitude of changes that would be needed to prevent debt from rising uncontrollably. Those who disagree with his plan should offer alternative ways to stabilize the debt. Certainly, that would be far better than the current practice of offering new spending programs and tax cuts that would worsen our already dangerous fiscal outlook.